Synopsis: Three friends struggle to find work in Paris. However, things become more complicated when two of them fall in love with the same woman. Did You Know? The 17-minute dance sequence at the end took a month to film and cost half a million dollars. I enjoyed the movie well enough the first time I saw it, but I couldn’t understand the point of the nearly 20-minute dance scene at the end of the film. This was back when I really hated musicals, so I groaned the entire time, rolling my eyes, wondering when it was going to be over. Then, the scene ruined the entire picture for me. Now, however, I paid closer attention to the sequence, and I can now appreciate the scene and film. 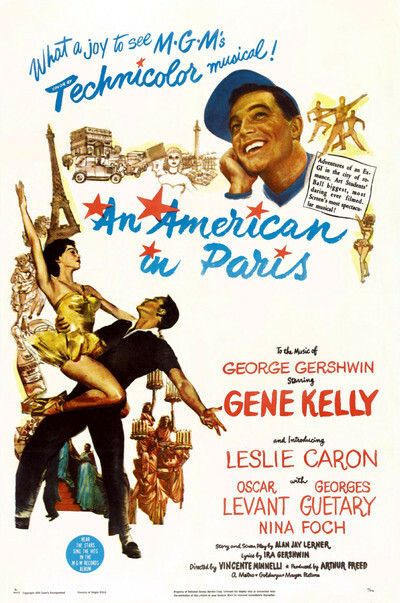 It’s a dream sequence, chronicling Jerry’s time in Paris, beginning with the culture shock he experienced and ending with Lise leaving him for Adam. Plus, damn! Gene Kelly can dance!